The Canon L-90 is highly regarded for its high quality prints and reliability. Some day in the not too distant future your Canon L90 will consume all of your printer toner, and when it finally does happen you'll quickly note that ordering Canon L90 toner is generally an expensive affair. Thankfully, however, you don't need to panic about dishing out the steep fees you'll get on the high street because here at Cartridge Save you can purchase all the Canon L 90 cartridges you'll need at seriously small prices. Spend less cash by ordering online with Cartridge Save! You don't need to overspend on the L-90 original cartridge or L90 compatible toner on the main street when it is far more easy to save a handful of cash shopping with Cartridge Save. Enjoy total satisfaction when buying LaserFax L90 toner cartridges from us seeing as everything is underwritten by a quibble-free money back guarantee. Take into consideration that every order comes with free delivery, usually arriving with you on the following day! Canon combines the convenience of a laser printer and a laser fax machine in one compact and user-friendly device. Unlike its predecessors, the Canon Faxphone L90 fax printer comes with a built-in handset. Users also love the impressive 15ppm print speed. However, the Canon L90 fax machine is heavy and not very versatile when it comes to media handling. 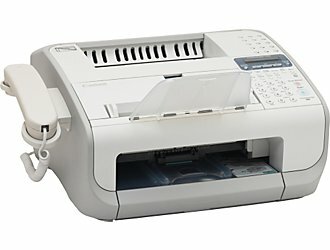 Built with a high-speed USB 2.0 interface, the Canon L-90 laser fax machine is a more advanced entry-level device compatible with higher operating systems like Mac OS X 10.2.8, Windows XP, and Windows 7. Its small footprint makes it suitable for a cramped office. There is a handset on the left-hand side of the L90 printer, while all buttons are neatly arranged on the top right-hand side together with the small display screen. The Fax-L90 printer uses a black Canon FX3 toner cartridge. The Canon Faxphone L90 toner cartridge is good for up to 2,000 pages and the plain paper fax ensures output that lasts longer than when printed on thermal paper. The Canon L90 laser fax boasts a super G3-compatible 33.6Kbps fax modem, and the laser engine is speedy enough to print 13 to 15ppm. The 30-sheet ADF is helpful when users need to multi-task with the Canon L90. The fax resolution of the Canon L-90 laser printer is only 203x391dpi and the speed dial programme is only good for up to 15 entries.